Yes, I am a Wayne Dyer junkie! As a matter of fact, in the third blog I wrote last year, The Power of We…Who’s Your Tribe, I mentioned that Wayne Dyer sits on my spiritual board of directors. If you have not read it, I invite you to do so. Of the 120+ blogs I’ve written, that one is still one of my favorites. If you do not have a spiritual board of directors, I highly encourage you to form one…wink, wink! Having like-minded supportive people whom we can connect to, without being judged, is vital to our spiritual and emotional growth. Whether dead or alive, the wisdom and life experiences we obtain from our support network is both therapeutic and validating. Our community of like-minded individuals help us see and process our world. Over time, our perceptions and thoughts change, we move from a scarcity mentality to one of being and having enough, we learn to lead with an open heart, we embody the power of vulnerability and authenticity, we shift from fear to love, we learn to flex our courage, we build our resilience muscle, we value our connections and learn the secrets for wholehearted living. All of this takes time, energy and a life-long commitment to change, growth, expansion and transformation. We must have that burning desire to learn and push beyond our boundaries. More importantly though, we must learn the art of letting go. The art of letting go requires us to live and lead from the heart. It requires us to leave our egos at the door and silence the nasty and obnoxious roommate we have living in our heads. It is recognizing everything that is holding us back and learning the skills to move forward. It is the utilization of every tool in our spiritual toolbox. It is when we live and work from that space in our hearts that we are better able to engage with ourselves, our friends and family, our communities and the world at large. That is what the art of letting go and wholehearted living look like. In Brené Brown’s Book, book, The Gifts of Imperfection, she designed “guideposts” for living wholeheartedly. These guideposts also make a cameo appearance in her book, Daring Greatly, and I will share them with you a little later. As I read each guidepost, I realized that each and every single one personifies what life here in “Earth School” is all about. You see, Earth School always brings us people, circumstances and situations to learn from. A lot of the learning comes from the exchange of information we have when we take part in meaningful and enriching conversations with others. These conversations allow us to share our insights, questions, speak our truth, share our wisdom and embrace new ways of looking at things. It goes beyond the nagging and complaining and having the same meaningless, dead-end, and shallow conversations that leave us feeling empty, without purpose, hopeless, negative and maybe even worse off than when we started. Whether we like it or not, no one is exempt from Earth School’s curriculum or its classes. The lessons may be tailor-made to suit our own individualized curriculums, but the over-arching themes are what lead us to wholehearted living. How we process our world throughout the process of living wholeheartedly is what spiritual awakening is about. Wholehearted living, in my mind’s eye, is about living a quality life AND thriving while doing so! I will leave you with the ten guideposts that Ms. Brown defined and encourage you to spend some time thinking long and hard about each one. Perhaps share them with your tribe, discuss them and maybe even journal about what may be keeping you stuck or may need tweaking. It is a good way for us to access where we are with our individualized curriculum. These guideposts are just that….a guide. Their purpose is not to create negativity or stress. We do enough of that for ourselves! Instead, look at the guideposts as tool to help us dig, delve, excavate and reveal the parts of our lives we may want/need to work on. Oh, and we must remember to acknowledge and celebrate the ones we have under our belts! Darlings, consider the guideposts your “cheat notes”….do with them what you please, or do nothing at all. As Wayne Dyer would say, the choice is yours by virtue of how you process your life….Change your thoughts, change your life! The new year is an auspicious time of the year to set goals, intentions, and resolutions of all kinds. A popular tool for doing so is a vision board. There are all sorts of classes, workshops, webinars and how-tos that help us design, create, and execute our very own vision board. All we need to do is google “vision board” and there are sites upon sites to explore and help us create one. Why are vision boards so popular? Because there is most definitely a power in visualization and manifestation. After all, we are divine co-creators in this most powerful, comical and magical universe. The art of vision boarding has become quite profitable to say the least, as we can see when we google them. We see supplies and resources of all kinds. In reality though, all we need are scissors, old magazines, glue, poster board and, if we prefer, a nice picture frame that we can use to display our creation. Currently, I have two vision boards hanging. One is more of a life visioning board in that the images and words represent and guide the life I live, how I want to conduct my life, as well as the meaning, purpose and significance here in this lifetime. The other vision board is more of a dream board…which I made in the new year of 2018 and represented what I wanted to manifest in my personal life last year. When we use pictures and words to depict our dreams, wishes and desires, we stimulate the emotional part of our brain. In doing so, we also activate the Law of Attraction. I don’t know about you, but anytime I have written anything down, put up images, power words, affirmations or motivational displays representing my wishes and desires, the universe conspired to deliver. I’m amazed when I come across some random journal entry from long ago and how what I wrote about has come to fruition. Darlings, whether you believe it or not, we all have the power to co-create anything we put our minds to. We are powerful beyond measure! On this New Year’s Day, I took the time to really look at and examine the vision board I made last January. Once I looked at all the images, words and phrases that I had used, I took the time to write each of those words in my journal. It was almost as if by looking solely at the words, I was able to see yet another vision that was created. In a sense, it gave me a different perspective. Perspective is something a beloved yoga teacher of mine spoke about in class this morning as she decided to start the class with all of us in legs up the wall. For the non- yogis out there, legs up the wall is an uber- restorative and highly beneficial pose. If there’s only one pose you could do each day, it would be legs up the wall. By being inverted, we are forced to look at things from a different angle. Since it was the start of the new year, my teacher chose to talk about looking at things from a different angle while we where in this pose. And looking at my vision board from a different angle is just what I did. I created the vision board in hopes of attracting a romantic partner in 2018. The images and words I chose represented the lifestyle I would be living. As I looked at my 2018 vision board and the words that I had chosen, I realized that I was, in fact, living that life..sans the romantic partner. Hmmm… how interesting and fascinating! After looking at my vision board from a different angle for quite some time, I realized I did not want to change or alter it for 2019. Instead, I want to work with it more actively and intentionally. How did I come to that conclusion? Well, I happen to come across a vision board checklist by Jack Canfield in Mantra Magazine, and I realized that I did not “truly” integrate all components of my board all as fully as I needed to. My vision board depicts goals and dreams in all areas of my life, or in just one specific area that I’d like to focus on. The images I chose represent or symbolize the experiences, feelings and possessions I want to attract into my life on my board. There are positive affirmations, inspirational words, quotations and thoughts on my board. Only words and images that best represent my purpose, my ideal future and words that inspire positive emotions and me were used on my vision board. My vision board is neat, and I was selective about what I placed on my vision board. I keep my vision board somewhere prominent, such as near my bed or on my desk. I leave my vision board in a viewable position as often as I am comfortable with. I spend time each morning and evening visualizing, affirming, believing and internalizing my goals. I look at the images that represent my achievements, and feel gratitude as my dreams begin to manifest. I wrote down the date I created my vision board. I create a new vision board each year. I regularly hold my vision board in my hands and really internalize the future it represents. I see myself living in the manner of my life is on my vision board. I regularly feel myself in the future I have designed. I believe the items on my board are already mine when I look at them. I am grateful for the good that is already present in my life. I acknowledge and celebrate any goals I have achieved. I acknowledge and learn from the changes I have seen and felt. I regularly acknowledge the law of attraction at work in my life. I have fun and never give up. And now, I will leave you with a laundry list of words, phrases and quotes for you to peruse, ponder and contemplate. Yes, there are so many! That’s because my vision board is quite large and some of the words are in all types of fonts and sizes (it wasn’t until I actually wrote the words in my journal that I was quite amazed at how many there were). Love-own your glow-light carriers-transform your world-bliss-good times-getting better all the time-live your best life-real-the yoga of awakening-fearless living-widen your world-eternity now-surround yourself with people who lift you higher-give happily ever after-balanced is beautiful-natural spiritual progress-share your passion with the world-when your vacation becomes a lifestyle-yes you can-believe-truly gracious-truly joyful-truly dazzling-truly daring-come out come out whoever you are-the magic-it’s a match-gratitude-when dreams take flight-the beach-great outdoors-shining moments-a place to dream-love begins at home-live in paradise inside and out-a place in the sun-gorgeous-living out loud-beautiful-a little night music-recharge your body and spirit-get away from it all only to discover more-where are we going-see, hear, taste, smell, touch-explore your senses-widen your world-glimpse the possibility of a diverse, peaceful and creative future-bathing beauty-go glam-adventures in the kitchen-homey eternity-bring some glamour to the table-time for reflection-your time is your own-resilience-integrate-self-awareness-engagement-vibrance-getting the love you want...didn’t I tell you were so many!?!? It’s time we all create and manifest the life we want and the changes we wish to be and see in this world. Now go create, dream and inspire… may the force be with you in 2019, my darlings! I saw the above quote on my neighbor’s Instagram, and it spoke volumes to me. It got me thinking, and thinking some more, and then realized I had to use it as inspiration for a blog. It’s safe to say that the world has always been a broken place, or we would not have the advancements, developments, and changes that have taken place since the dawn of time. We humans have been broken and flawed as well and, with each generation, we hope we do better and leave things a little better than our parents and their parents before them. If it weren’t for things gone wrong in history and over the progression time and space, things wouldn’t be fixed, and there would be no reason for just causes. Ghandi’s famous quote, “Be the change you wish to see in the world” wouldn’t be on the tips of everyone’s tongues, on clothing, accessories, furnishings and a myriad of social media platforms. What’s important is that we, as a human race, are awakening and evolving more rapidly than what seems like any other generation before us. That’s what technology has done for us. Every thing we need to know, what to do and how to do it is at the tips of our fingers…merely keystrokes and seconds away. However, it’s what we do with the knowledge we obtain that is the key. How we integrate this knowledge into our being and everyday life is what propels us to those higher levels of awakening and ascension. It’s what allows us to tap into our inner light and shine it brightly. It’s how we integrate this knowledge and apply it to everything in life… our encounters, struggles, challenges, interactions and personal and professional relationships. We cannot master a skill without experiential knowledge though. We can have all the book smarts in the world, but unless we immerse ourselves in practicing, engaging, sharing, comforting, giving, serving and allowing ourselves to be an active and vulnerable participant in the shared human experience, we may as well dig a hole and jump into it. We cannot light the way for others if we do not see our own light… our own influence, which is remarkably exponential by the way! Well, we can start by acknowledging all those broken places in us, in our families, communities and in the world and asking ourselves how we can be the light that seeps in. What work do we have to do that will ultimately lead us to sharing our stories, insights, knowledge, passions, strengths and gifts with everyone around us? What work have we done that we can share with others? What mountains have we had to climb that has prepared us to do just that? I have been having conversations with friends recently about our individual mountains. Whatever it is we’ve gone through/are going through, can NEVER be in vain. It’s all so connected to our life’s purpose and our ability to be the light that mends our broken world with love, peace and harmony. While it may take some time, and many lessons, we start to look back and connect the dots, we start to see the big picture… that which is our distinct essence- our higher calling and higher purpose/destiny. We may even have more than one purpose! Darlings, our stories, experiences and challenges need to be shared, books written, support groups established, speaking engagements solidified, articles authored, websites designed, blogs started, programs, businesses, trainings and webinars created, non-profits founded, gardens planted, cakes baked, venues decorated, art (in all forms) created, songs and poetry written, movies and plays directed, produced and filmed and performances of all kinds scheduled. The list goes on and on…this is how we shine our own unique and essential light. This is how we climb our individual mountains, integrate all our experiences and celebrate our doing so. This is how we light the way, forge a path for others and leave our broken world a little better than when/how we found it. This is how we mend it, contribute and pay forward. This is how we inspire, love, serve. What are your experiences calling you to do? Whatever it is our experiences are calling us to do, me must tap into our inner artist, dreamer and creator to lead the way, and our desires are guaranteed to be driven by love and passion. And speaking of passion, I will leave you with some exceptional and inspirational quotes that are sure to get all of us thinking, dreaming and creating! Tis the season to sparkle, my darlings! So how about we all go about doing just that? Let’s all shine brightly…and remember to love extravagantly, intentionally and unconditionally! Dedicated to my niece, Megan, on being chosen as Teacher of the Year by her peers. She’s had her own mountains to climb this past year, but she did not let that affect her performance, love of teaching or her studies. At the age of 30, she is most definitely on the path to greatness! One of the beauties of disconnecting from social media and taking a digital detox is that we can appreciate the fullness of life and the spaciousness of all the hours in a day’s time. It’s like having this huge vessel called “time” at our disposal for us to do whatever we want…to fill it however we want without getting caught up and sucked into endless and mundane hours of social media feeds, emails, texts and phone calls. Whenever I get away, which is usually for a 3-4 week period, I intentionally unplug. I want to take in Mother Nature’s elements, eyes wide open, feel her gifts and allow the sense of spaciousness, awe and wonder carry me to parts unknown. Oftentimes, those parts unknown are the deep dark places in my soul that are calling for some attention and want to come out and play. I find myself so totally present and immersed in my surroundings, that I lose track of the time of day. As a matter of fact, time isn’t even an issue, unless I have to be showered, dressed and ready to go out somewhere. What I found this past August was that my days seemed extra long. There was a sense of expansiveness and vastness, as if extra hours had miraculously been added to my days – more so than other times I’ve unplugged and disconnected. In addition to being off social media, I barely had my phone on me. When I got to it, I got to it. The other thing I find during these periods is how my creativity gets sparked, how ideas for future blogs seem to pop up, and how many books I get to read. More importantly though, I love the sense of lightness, clarity, mindful presence, and the peace and calm that washes over me and carries me through my days. I like how being 100% present for whomever I am with feels deep down in my soul. Time is sacred my darlings, and we should not take it for granted by filling it with meaningless pollution that robs it of its sacredness. These periods also offer a window into the lives of people who are living in a total state of distraction. People who can barely complete a sentence without looking down at their phones and getting caught up in a text, alert of some kind, or sucked into the dark hole of social media feed “oblivion.” Forget about even having a meaningful conversation when they can’t even complete a distraction-free sentence. I may have asked you before, but do you cringe when you hear people go on and on about how “busy, very busy, very very busy they are?” Or is it just me? I often wonder if being able to say how “busy” we are is some sort of badge of honor. A badge of honor that leads to exhaustion, lack of sleep, meaningless conversation, lack of wonder, creativity, and appreciation for the enormous amount of untapped beauty, nature and magic that surrounds us. A badge of honor that is keeping us from living a wild and succulent life. Mother Nature’s gifts are all there for us to see, feel, hear, smell and taste. What are we waiting for? Why are we waiting? The time is NOW to live fully and to take big juicy bites out of life. If not now, then when? Darlings, let this blog be an invitation for living a succulent life! As if on cue, when I got home and was unpacking and putting away my journal, magazines, etc., I happened to notice that one of my favorite books seemed to pop out of nowhere. The delightful book, Succulent Wild Woman – Dancing with Your Wonder-Full Self! by SARK is a fave of mine because it is jammed packed with inspiration and topics like being and becoming a succulent wild woman, fears, outrageous adventures, blocks to succulence, healing, sexuality, love and romance, creative expression, money and power, building a succulent community, and more. At the end of each chapter there are even books, resources and music to further guide and awaken our wonder-full Self. Shout: I’m here! I’m succulent and I’m loud! I think it’s time I re-read this book, considering I am entering a new decade in life! As a matter of fact, I may just start as soon as I finish writing this blog, especially since it’s a rainy, gloomy Sunday, and that sets the stage for a perfect and quiet day of reading. Wishing you much succulence today and always! Greetings, darlings, and welcome to blog number 100! I can’t believe it was one year ago today that I published my first blog after lots of encouragement and the support of some friends. I guess it was the right time, and I was in the right place. Happy Anniversary, InspireLoveServe! While I was away this past month, I toyed around with ideas for an anniversary blog, scribbled some things down, yet ultimately knew that what I wanted to convey was just a profound sense of gratitude for being able to inspire, love and serve from the very depths of my soul. Gratitude for the love and support of friends, family and acquaintances. Gratitude for their support and encouragement. Gratitude for my yoga and meditation teachers. Gratitude for being able to share my lessons, blessings, struggles, mistakes, successes, eccentricities, energy, passion, guidance, reflections, tools, resources, thoughts, ideas, insights, and, oftentimes, my wit and sense of humor, and my overall animated self. Gratitude for being able to speak from the heart. Gratitude for a lifetime of journaling. Gratitude for my inner fortitude and resilience. Gratitude for those of you who participated in one of my personal homework assignments and shared the three words / sentences that best described me. Gratitude for the over achievers who couldn’t stop at three. Gratitude for not being overly preoccupied with the number of followers or comments I receive (or lack thereof). Gratitude for the bloggers out there who have found me and are following me. Gratitude for the people who take the time to read, reach out to me and share how a particular blog resonated for them. Gratitude for those of you who have shared or passed on my blogs to others. Gratitude for the strangers who have found their way onto my blog and have shared it too. Gratitude for a year that has been filled with much creativity, reflection, courage, transparency, openness, healing, growth, fun, laughter, transformation, confidence, authenticity and, above all, joy. And speaking of joy, I have joyfully and unapologetically stepped into my authentic power at this stage of my life, and upon deciding to start a blog. Yippie! It’s been a long road. The blog has evolved and will continue to evolve, as I have evolved and will continue to evolve as well. No stagnation for me! I truly feel a deep sense of accomplishment and purpose in being able to use my personality to serve what my soul came here to do: inspire, love and serve. And speaking of inspiration, I recently completed the latest Deepak and Oprah 21 Day Meditation Experience, The Energy of Attraction, and I loved it so much that I purchased the series (as I oftentimes do). As I started listening a second time around, I came upon a comment that Oprah shared which really hit home for me: “You’ll know when you’ve hit your sweet spot when your desires are more about being than getting.” Perhaps that’s why I am not overly concerned at this point in time with numbers and statistics related to my blog??? Instead, I am allowing my soul and my purpose to be my guide every time I sit down to write. Handing my writing over to God and the Divine always works best! After all, they are the overseers and keepers of my soul here on earth. While I ultimately would like to gain more followers and have more interaction with my readers, I know it will occur when the time is right. As a matter of fact, I have quite a bit of homework to do in that department! For now though, my hope is that each blog lands in the hands of whomever is meant to read it. As they say, “Take what you need and leave the rest.” That’s the approach I have taken up until now, and it feels genuinely good in my soul. It truly is about being and not getting, so I guess I’ve hit that sweet spot. And on that note, I will leave you with a lovely prayer that I hope fills your heart with joy and inspiration. It was written by Joyce Rupp. I’m not sure where I picked it up, but it is most appropriate as my heart is currently overflowing with gratitude as I write this anniversary blog. To be grateful for what is, instead of underscoring what is not. To find good amid the unwanted aspects of life, without denying the presence of the unwanted. To focus on beauty in the things of life, as well as being deliberate about the great beauties of art, literature, music and nature. To be present to one’s own small space of life, while stretching to the wide world beyond it. To find something to laugh about in every day, even when there seems nothing to laugh about. To search for and to see the good in others, rather than remembering their faults and weaknesses. To be thankful for each loving deed done by another, no matter how insignificant it might appear. To taste life to the fullest, and not take any part for granted. To seek to forgive others for their wrongdoings, even immense ones, and put the past behind. To find ways to reach out and help the disenfranchised, while also preserving their dignity and self-worth. To be as loving and caring as possible, in a culture that consistently challenges these virtues. To remember to say or send “thank you” for whatever comes as a gift from another. To be at peace with whatever cannot be changed. Darkness all around me. Raindrops falling on my dewy skin. The fresh scent of rain permeates my inner being. Rough waves crash & collide and become one on the shoreline. The breeze blows and the palms sway. Twilight is turning into dawn. It’s amazing how memories are stored in our bodies and on a cellular level! As I typed each piece, I was transported to the exact time and place where I wrote each one. Memories flooded my mind and sensations crept through my body. Memories of hope, love, peace, humanity and the intention to live a life of purpose and meaning, as well as leave behind a legacy of love, peace, service and unity. All this still lives wildly in my heart, and I gratefully approach each new day with a sense of steadfastness, integrity, intention and grace. It is a practice, both on and off the yoga mat, as I move through my days. How do you move throughout your days? Do you set intentions? What legacy are you creating? Remember darlings, we all have much to offer. Now go out and find ways to inspire, love, serve AND lead from the heart…right from the start! PS: Throughout the remainder of April, my blogs will be published on Sundays only. 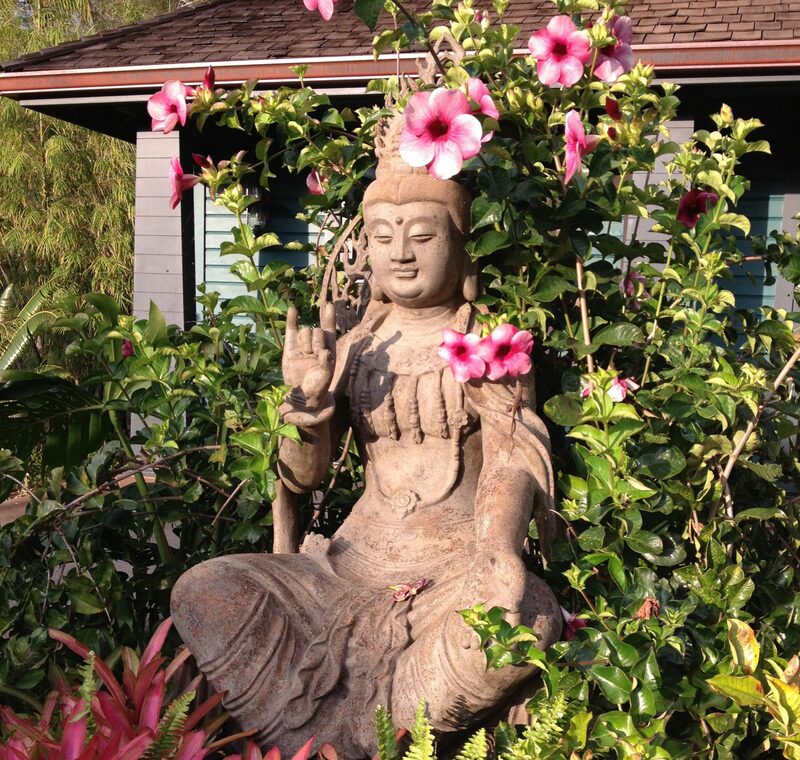 I will be going on a yoga retreat next week and need time to prepare then time decompress as I renter….wink, wink! I love Sandra Magsamen! A friend of mine turned me on to her art years ago. You’ve probably seen her plaques, mugs, books, cards, ceramics, and calendars bearing her signature images, motifs and messages from the heart. They are colorful, uplifting and make you smile. Just the other day, I pulled her book, Living Artfully, off the shelf. I haven’t looked at it in about ten years or so, and I think it’s about time to start perusing it again. Her book reminds us that we are indeed the artists in our lives. The problem is that many of us have let our paints dry, we’ve put away our brushes, forgotten our dreams, have let 24/7 electronic connectedness consume us and have forgotten how creative we were as children. We have forgotten the power of our imagination and the possibilities that dwell in our creative force field. It’s time we reclaim the dreams, possibilities and rediscover our creative power. Why? Because it’s fun, and I’m sure you will agree that we need to have more fun! What did I love to do when I was a child? How did I fill my days? Who and what made me happy? What are my most cherished memories? What things and activities did I truly treasure? What things did I really not like? Let your imagination run wild here as memories flood your mind. Allow all your senses to engage you. Visualize every last detail of those memories – the sights and the sounds. Connect with the feelings that these memories evoke. Think about the hours you spent playing, imagining and creating all sorts of things. Even people who’ve had less than pleasurable childhoods used their imagination to create a life they would want to have someday. And guess what? Many of them did. They held onto hope and tapped into their dreams, strength and became resilient. Along the way, they learned the power of creativity, visualization and the law of attraction. At some point in all our lives, we must take the time rediscover our creative power. In doing so, we come alive…..in living color! Oh, and we must ask questions, a whole lot of them! In Living Artfully, there’s mention of a UCLA study that documented the following: on average, at age five we engage in creative tasks 98 times a day, laugh 113 times a day and ask 65 questions. By age forty-four, the numbers fade to 2 creative tasks a day, 11 laughs and 6 questions. Keep in mind, this book was published in 2006. Also, I don’t know when that study was done, but I would be willing to say that in today’s world, where children as young as one and a half are already addicted to their parents phones and even have their own iPads, the numbers have really dwindled. All the more reason we must foster an environment of creativity, fun and play. And what better way to do it than to meet that head on, full throttle, and in hot pursuit! It starts with us adults learning how to be a child again and awakening our senses and lust for play, imagination, curiosity and invention…..each and every day. In doing so, we gain confidence, and it does wonders for our self-esteem! Tapping into our creativity encourages us to color outside the lines and to take risks. We become more flexible and open. We embrace mistakes and find creative solutions. More importantly though, we are able to live more fully as we actively engage all our senses and savor the beauty, magic and possibilities around us. Just think how inspiring this could be to the little ones in our lives! Darlings, I hope this blog joyfully inspired you and that you discover more ways to live a life that vibrates with creativity and inspiration. Now go out and tap into your creative power and create away! Can we agree that we are all students here on “Earth School?” Can we agree that we are all teachers on earth school as well? This is a beautiful conversation we can have with ourselves and the fellow students and teachers in our lives. Just yesterday one of my friends and I were having such conversation over brunch. Remember, the best and juiciest conversations can be had over a delicious meal! My friend and I acknowledged how we’ve each learned from each other throughout some of our challenging times and how we freely and openly dance between the roles of teacher and student. As the Buddha stated, “When the student is ready, the teacher appears.” How true is that! Who are the people who are inspiring you these days? How do they inspire you? What insight(s) have you gained from them? Have you been prompted to take on a new course of action? Have you experienced a shift in perspective? What challenges have been your greatest teacher? Earth school always brings us people, circumstances and situations to learn from. A lot of the learning comes form the exchange of information we have when we take part in meaningful conversations with others. Conversations that allow us to express our insight, questions our motives, speak our truth, share our wisdom and embrace new ways of looking at things. It goes beyond complaining and having the same meaningless, dead-end conversations that leave us feeling empty and without purpose – or angry and frustrated that we wasted our precious energy. Have you embraced your authentic self? Have you embraced the teacher within? What insight or inspiration can you share with others? What are some valuable lessons you’ve learned that you can pass on if given the opportunity? How can you creatively share your wisdom, insight and gifts with others? Are you open to receiving wisdom from others with openness, love and joy? How can you embrace and live the fullest expression of who you are? My darlings, there are many colorful and creative ways that we can express our ideas, insights, and teachings with others as the day is long. I encourage you to not only embrace the teacher within, but let your inner teacher come out and play! As long as we are here on earth school, we are creating every moment of our life in everything that we do or say. Color outside the lines ( which is something I love to do) and be passionately creative!